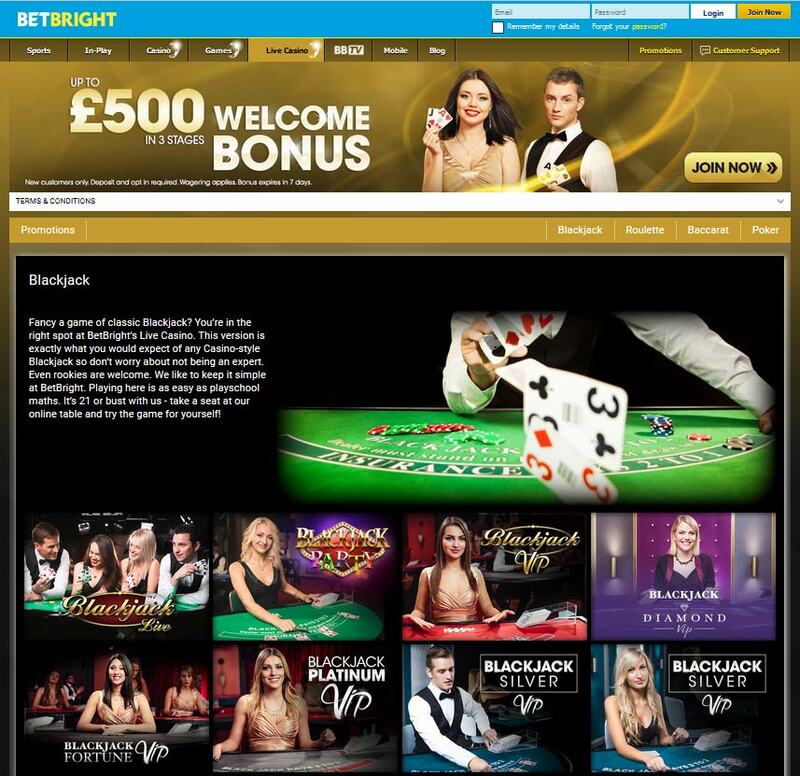 Betbright Casino is one of the few UK-licensed casinos around and has been highly sought after for game lovers resident in the United Kingdom and Ireland. As a customer centric brand, Betbright have ensured that its services are strictly monitored and in line with the dictates of the UK Gambling Commission. The details of the license agreement are made conspicuous at the bottom part of the casino. However, another critical selling point for Betright casino is the fact that the parent company Dedsert is a seasoned customer service provider with expertise in telecommunications as well as gambling. This pool of expertise is what naturally places Betbright at the top of the online casino range in the UK. Since 2012 when the website was launched, it had been focusing more on other forms of gambling with the casino section only recently added leveraging on the Microgaming software. 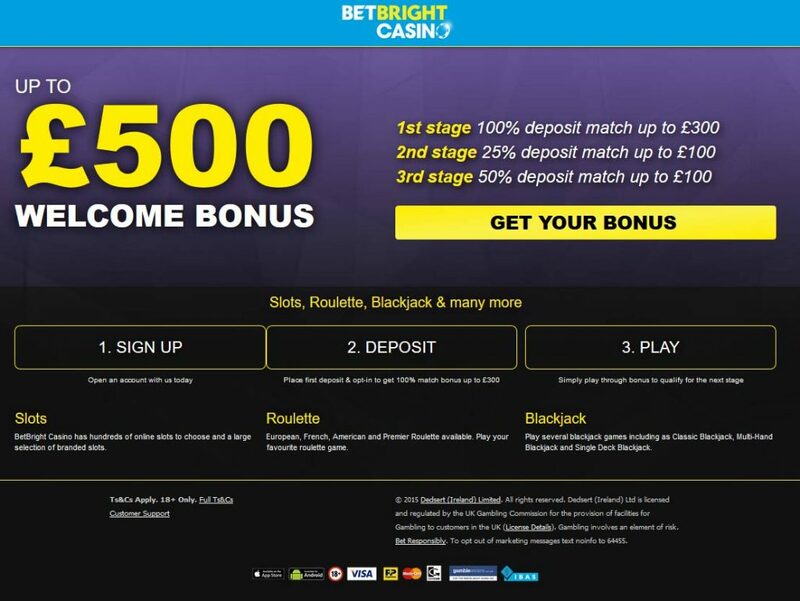 Another selling point that has engineered the success of Betbright Casino is the ingenious way it handles customer rewards in terms of bonuses and promotional offers. Players can subscribe to the BetbrightPlus program where they can collect loyalty points based on the frequency and transactional volume of the gambling activities. Now, in a dissimilar fashion to competition, players at Betbright do not have to trade such points in for cash, but instead enjoy prizes including free spins, cash and free bets every Monday. This policy has brought up some sort of weekly competition where players can be duly rewarded for their efforts during the past week. Usually, the range of points that can be gathered on a weekly basis is between 100 and 100,000 points and the highest number of points can win a player up to 1000 GBP in rewards. 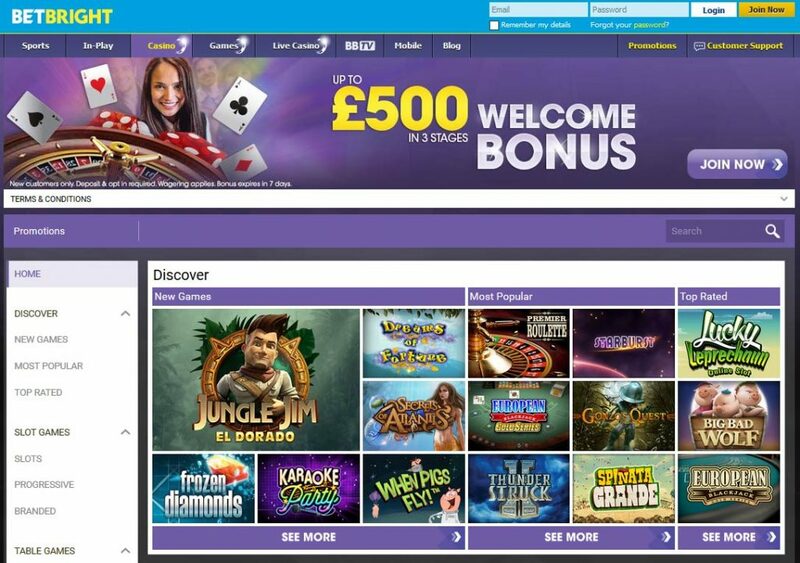 Betbright Casino uses the Quickfire platform to run its casino which ordinarily translates to the fact that all the games produced by Microgaming can be enjoyed at the casino even without the stress of having to download them on your personal computer. There is also the opportunity of trying out the games before eventually signing up which also means you do not suffer the risk of having to stake your money for games you haven’t really gotten a hang of. There is in fact a “Play for Fun” button when you hover with your mouse pointer on each of the games on offer. The ease of use of this online casino is also very worthy of note. The lobby is carefully designed such that being stylish does not make things clumsy. 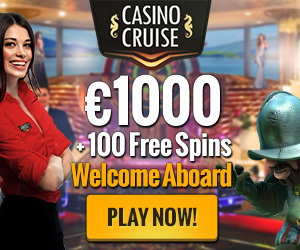 There are more than 130 games which include but is not limited to slots, card games, roulette, video poker games, and multiplayer games like the Multiplayer Roulette, Diamond Edition, Wheel of Wealth and the Avalon Multi Player Slot. Slots lovers are treated to over 100 slots particularly the Game of Thrones, Thunderstuck II, Castle Builder, The Dark Knight, Immortal Romance, The Dark Knight Rises, Tomb Raider and many more. There is even the highest playing progressive slot from Microgaming, Mega Moolah. For those who enjoy card games, there is a wide pool to choose from blackjack and poker games with half of them from the Gold series. There is also about 4 variations to the roulette which are the European, American, Premier and the French Roulette. There are also about 6 different video pokers. Although this is not particularly verifiable, the list of latest winners in this casino and the sums they won is usually uploaded to the homepage of the betbright casino website. With everything going mobile Betbright like every other forward thinking casino has developed a mobile brand. Its design ensures that it is not only very easy to download and install but also loads quickly. There is also a desktop app that doesn’t require a casino app. Despite all these offerings, Betbright have ensured that more than enough games are available for the enjoyment of the players. There are over 48 slots like the Game of Thrones, Hitman and Football Star and many more which we have been earlier discussed. Also on the mobile casino, players can enjoy up to 5 card games, one roulette and 4 video pokers. From our own standpoint, this mobile version seems to fit every bill especially with the variety of games and brilliant technical and customer support. Accessed via a separate tab is the BetBright Live Casino. Players can enjoy this top notch gaming experience by clicking on the Live Casino tab. This gaming establishment offers Casino Hold’em, Roulettes, Blackjack and Baccarat most of which are rarely provided by other casinos. Perhaps you happen to get bored of playing games at the casino and may want to try your hands on something else, we suggest that your sift through the several sport varieties offered by the non-casino section of Betbright like Football, basketball, tennis, cricket, hockey, horse racing MMA amongst several others. You could also try the NovaBall which fixes unique odds on the outcomes from different national lottery games. Players just have to pick 7 numbers of 1 to 49 to stand a chance of winning 7 million GBP two times a week. Betbright offers customer support via live chat, email and telephone support. For UK residents, a UK number (08453996570) has been provided for live calls between 8 AM and midnight every day. Emails can also be sent to [email protected]. From our experience, the livechat is clearly the best but you should keep an open mind.